Intensive Repair Shampoo + Conditioner Bundle for dry, coloured, chemically-treated & frequently blow-dried hair by Green People, save money when you buy your Shampoo and Conditioner in a bundle. 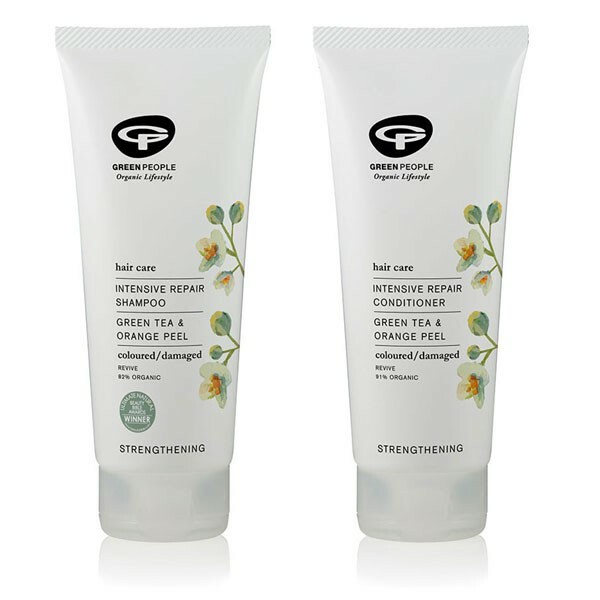 Green People Intensive Repair Shampoo - Strengthens and repairs damaged, weak hair, with Vitamin B5, Green Tea and Plant protein. 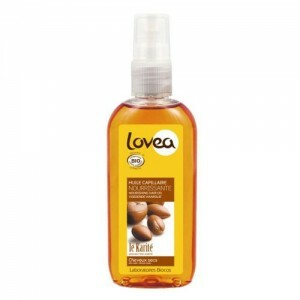 Replenishes natural oils and enhances shine, the ideal shampoo for damaged, coloured, straightened and blow dried hair. 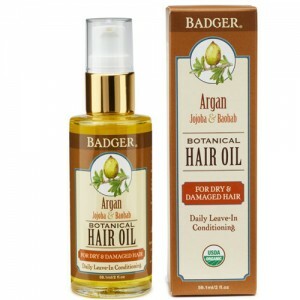 Leaves hair feeling soft & clean but is very concentrated and long lasting - a little goes a long way! 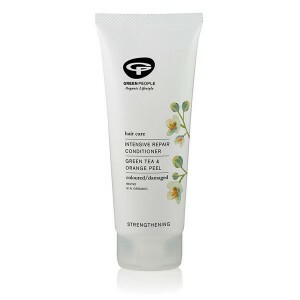 Green People Intensive Repair Conditioner - Repairing conditioner for coloured, treated & blow-dried hair. This conditioner is a welcome treat for stressed out hair. Chosen as one of the Top 7 Organic Products by The Times!. Enriched with Green Tea, Horsetail and B vitamins to boost shine and nourish scalp and hair shaft preventing scalp dryness and loss of natural oils. *Herbal Infusions of: *Equisetum arvense (horsetail), *Thea sinensis (green tea). Cetearyl alcohol (plant wax extract), *Aloe barbadensis (aloe vera), Cetrimonium chloride (conditioning agent), *Simmondsia chinensis (jojoba oil), Chenopodium quinoa (quinoa oil), Lecithin (plant protein), Faex (vitamin B), *Citrus reticulata (mandarin oil), *Citrus aurantium bergamia (bergamot oil), *Citrus aurantium dulcis (sweet orange oil), Citric acid (from citrus fruits), *Pelargonium graveolens (rose geranium oil), Santalum austrocaledonicum (sandalwood oil), *Lavandula angustifolia (lavender oil), *Citrus sinensis (orange oil), *Linalool, *d-Limonene, *Geraniol, *Citronellol (from essential oils). 92.0% certified organic ingredients. Apply small amount of Green People Intensive Repair Shampoo to wet hair & gently work through to ends. Rinse thoroughly. For best results follow with Green People Intensive Repair Conditioner.